I have officially committed to participating in the AVON 39 Walk to Cure Breast Cancer. I am part of a team with three other women from my work who are all fun, smart, and funny so I hope that will make the training and the walk itself entertaining in addition to meaningful. I have wanted to do this walk for many years and am proud of and pleased with myself for finally doing it. I know far too many women who have been diagnosed with breast cancer and anything I can do to help contribute to research and services for women living with the disease is good. I will be walking in memory of Alya, who died far too young at age 44. 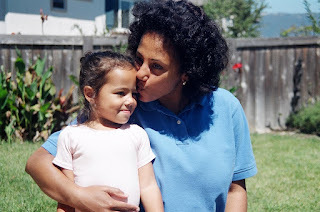 This Alya with my daughter, many years ago. If you have someone you'd like me to add to my "memory list" let me know their name and please consider making a donation to my efforts. Thank you! The walk takes place this September in Santa Barbara and Carpinteria, CA, with a total of 39 miles over two days. We walk a marathon the first day and a half marathon the second day. We have a three month training schedule and I laughed out loud when I tried to map my training walks when I saw just how far 10, 15, or 22 miles is in my town!